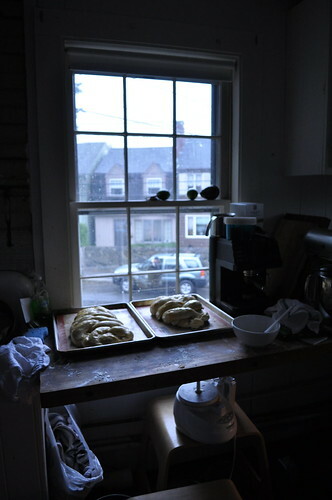 This afternoon I attempted making challah or egg bread. Challah is a traditional bread eaten on the sabbath. I’m not Jewish but I have eaten my fair share of this wonderful sweet bread. When we lived in New York I would pick up two loaves on friday nights for the weekend. I would eat half of the first loaf on the way home. I’m salivating dreaming of the warm sweet bread studded with chocolate chips crumbling inside the bag as I shoved bites inconspicuously into mouth on the train ride home. The remainder became Sunday morning french toast. I need more practice braiding but overall not so bad for the first try. The bread is delicious. The loaf at the very bottom is for Sunday morning french toast. I used golden raisins in the french toast loaf which is amazing paired with maple syrup. Above and below photos of the two loaves I made. 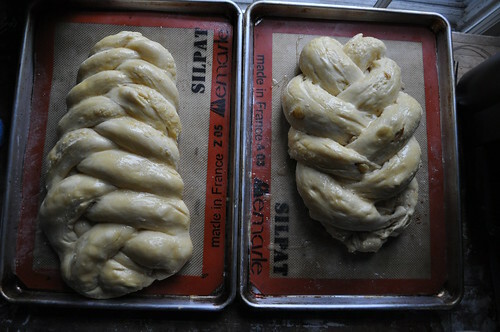 Greg help braid a loaf—his looks fancier then mine. 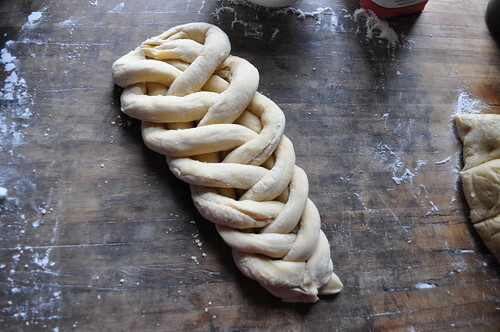 He’s excellent at tying knots so I though challah braiding might be up his alley. I used Smitten Kitchen’s recipe found here. Happy Weekend! 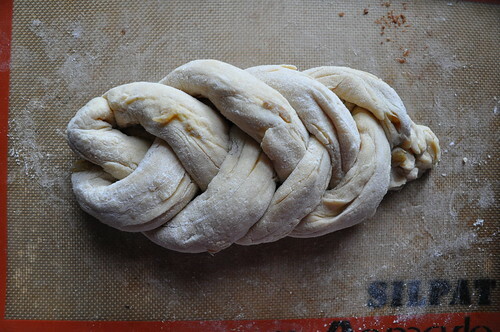 Oh my goodness: Beautiful, beautiful challah bread. I want to make some now! Bravo! Looks beautiful! Bread making is so weirdly rewarding isn’t it? As an artist myself, I find that there is something so familiar about it, its like creating a piece of art. You should try making a bread pudding with the challah bread. Delicious! Giada has a great recipe for bread pudding that uses the panatone bread but I have made it with the challah and just as fabulous. hi there katy, you sure did make some beautiful loaves! 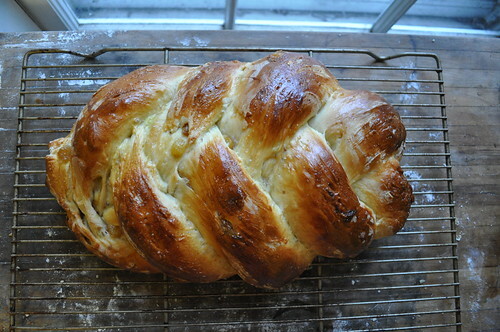 i had to learn to make challah when i married a jewish boy….almost 16 years now…i hope you had fun making it. bread making is satisfying isn’t it? nutella is beyond incredible on challah. i admire all your bread making! it looks so yummy. i can almost imagine the butter melting on the warm bread. The floor is going to get pulled up. The beams supporting the room (below) need some work. Once they are fixed we’ll pull up the floor and see what we are dealing with. I’ll probably try to seek out some old floors that have been ripped out of another old home. Pretty easy to find just expensive. But the room isn’t that big. We’ll cross that bridge when we get to it. That looks amazing! I am going to have to try to make some myself. These sound – and look! – yummy. It’s fun to see how they look both before and after they’ve been baked. I can’t imagine how good french toast would be with them – outrageous! My 4 year old loves Challah. She named a dollie Challah. We have to try this out. Thanks for sharing your efforts with us! Challah is one of my all-time favorite things to eat. Your loaves are gorgeous and the photos breathtaking. That bread looks so yummy. I’ve never made bread but it is on my list of things I would like to try. Challah bread is one of my favourite types.